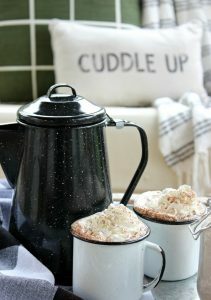 Today I’m teaming up with 24 other bloggers for the “Cozy Winter Home Tour”. When I think of cozy, the words that come to mind are . . . warmth – comfort – soft. To make my home cozy for the cold and blustery winter months, I began by focusing on the textiles that bring that cozy feeling! First, I like lots of pillows in varying textures, but all cozy. On my sofa there are gray, brushed cotton pillows with down inserts – nothing is more cozy than a squishy down pillow! Next, there are popcorn textured winter white pillows that remind me of soft winter snow. The plaid fabric on the third set of pillows is reminiscent of a soft plaid flannel. A faux fur throw is at the ready in a basket near the sofa – perfect to snuggle up on an extra cold winter evening. My fireplace mantel holds a simple winter vignette. I used more of the plaid fabric to create a “C” monogram initial and tied it to the windowpane mirror using black gross grain ribbon. I kept the glass hurricanes on the birch slabs because there’s nothing like candlelight to create a cozy environment and those birch tree slabs bring in some added texture. 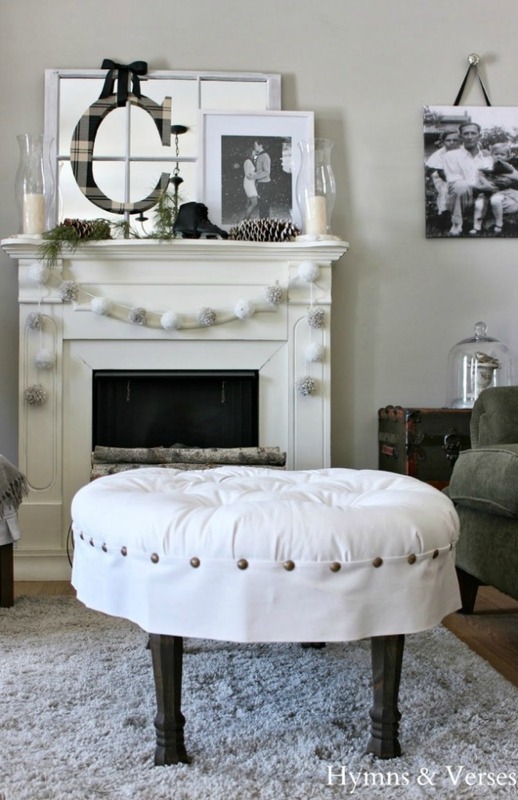 And, a fun pom pom garland draped from the mantel top adds another soft, textural element! 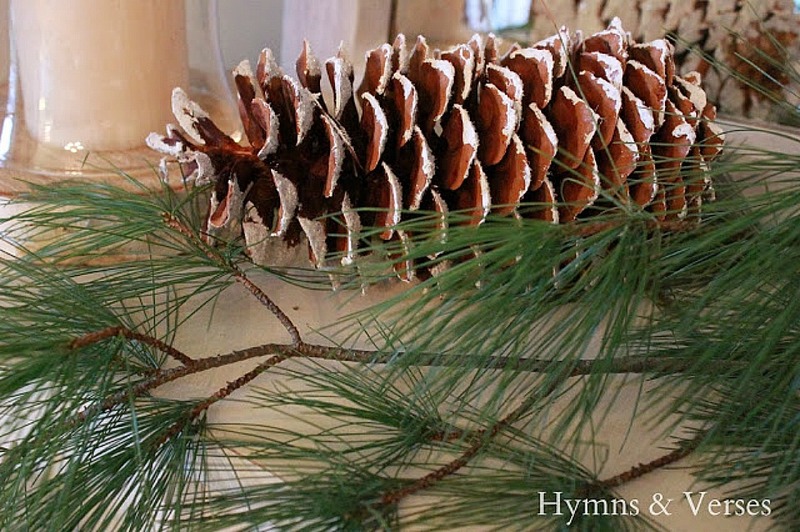 See how easy it is to make this pom pom garland HERE. 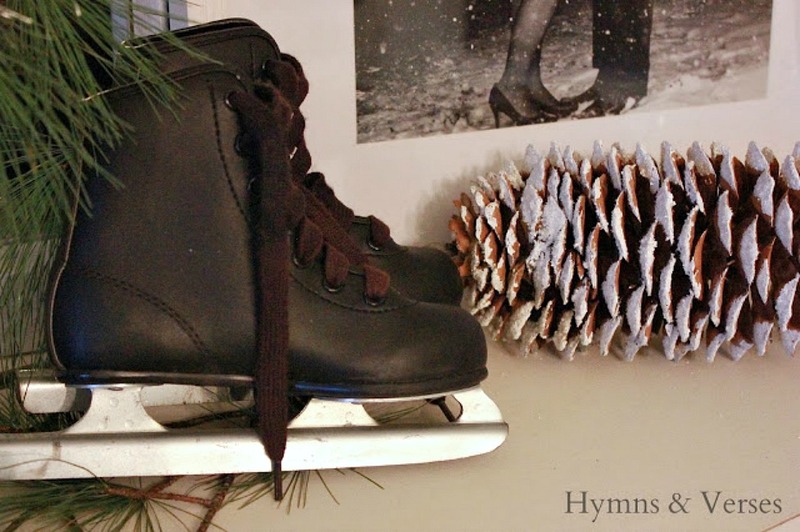 Large snow tipped pinecones, a branch of white pine, and a pair of tiny ice skates keep the winter spirit alive. This photo is one of Josh and Sarah’s engagement shots of them standing in the snow – perfect! On the other side of the fireplace is a side chair draped in a soft, wool throw and another pillow made from a recycled sweater. 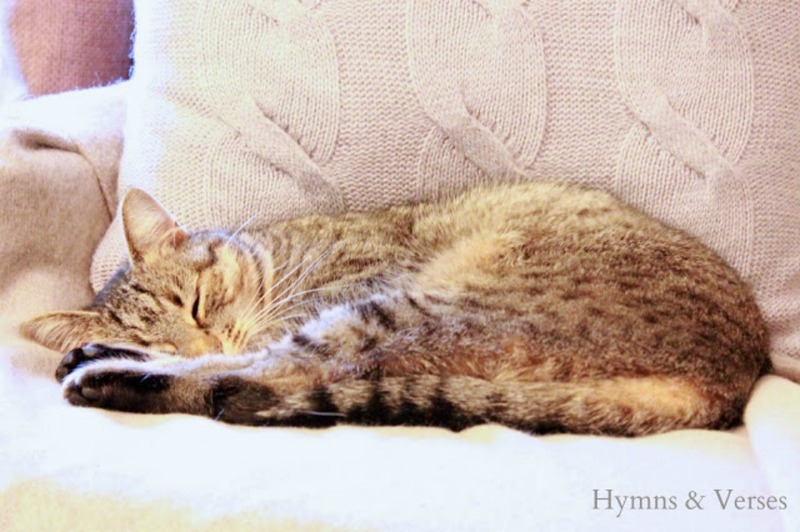 As you can see – this is a favorite cozy winter spot for someone in the family! I hope you enjoyed how I used various textiles and texture to create my cozy winter living room. Thanks for stopping by today – stay warm and cozy! Just beautiful!! I love your sweater pillows! They look so warm and cozy. I love items with texture! And your kitty! Is this the one who goes off and has adventures in the woods? Why?! When he can curl up in your lovely home?? Yes – that's her Linda! She had been gone for a few days, but came home yesterday! This chair and the basket with the throw are her favorite cozy spots! 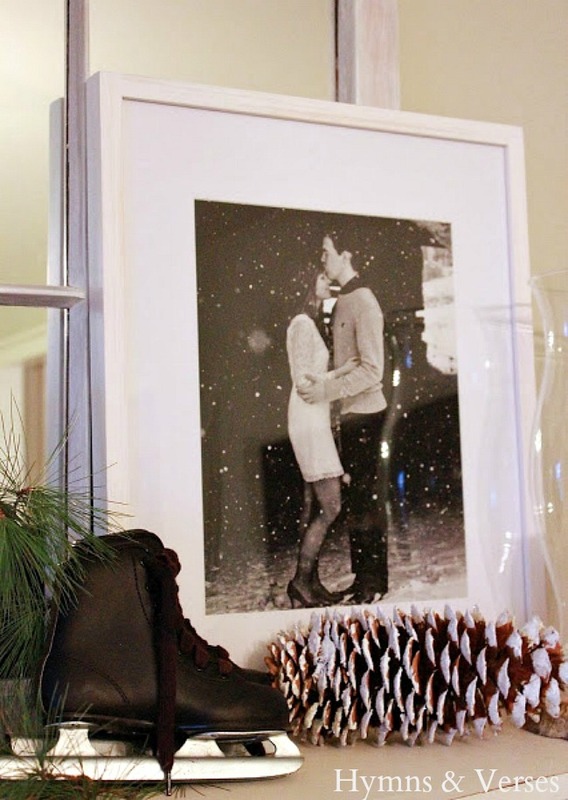 What a sweet mantle vignette – I especially love that adorable snowy engagement photo. How perfect. Thanks for sharing! Everything looks perfect. I adore that plaid initial…I just may have to copy that one! Ann – I know you love fabric as much as I do! 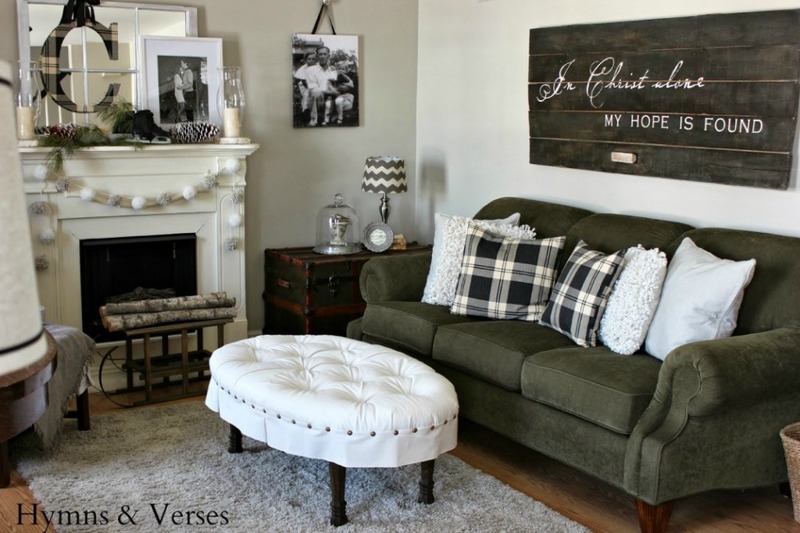 Right now, I'm in love with plaid and buffalo check! Nice and cozy, Doreen and your kitty looks very comfy. So, so pretty Doreen! I'm drooling over the black and white plaid. Your kitty baby looks so sweet all cuddled up. I've enjoyed partying with you at the Cozy Home Tour this week! I absolutely love the sign over your couch. I love using verses and phrases around my home. Your place is definately cozy. Oh, also, Doreen, if your pompom garland is missing some morning, just come down to my house to check. I've probably snuck it down to my mantle. Love poms poms!! Beautiful mantel… and beautiful engagement shot! I love the pom-pom garland. Perfect for winter! Doreen everything is beautiful! I just love your winter-y mantel and that photo is precious. 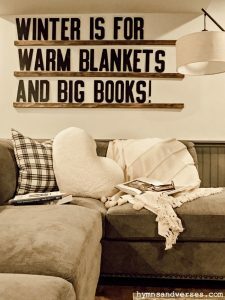 You've definitely created a warm and cozy space! Your home is so pretty and definitely looks cozy and the perfect place to relax. Awww … love your kitty! Love that pom pom garland too! Everything is beautiful. I adore your mantel, Doreen! The pom pom garland is the perfect finishing touch. The whole room exudes comfy coziness, definitely the best place to be on a cold winter's day! How fun to discover your beautiful blog. Coming over from On Sutton Place and Stone Gable. Definitely cozy. I love the pom pom garland! Oh Doreen! I love your cozy, cozy house! Did you post a tutorial on the pom poms? It looks wonderful! Your home is so beautiful!! Love how warm it feels! Love your cozy room, and that photo is just right. I love it especially with the snow. Nice touch on the skates too.